Have you ever wanted to sip a cocktail at a bar while flying at 40,000 feet? Or take a relaxing, hot shower halfway through a long-haul flight? You may think these kinds of experiences are out of reach, but that’s not the case if you’re a Qantas Frequent Flyer member: Qantas Points can be used to fly business and first class with Emirates (where you’ll find such luxuries) and this is easily one of the best uses of Qantas Points. Emirates’ has a huge international network and makes a decent amount of premium award seats available. In Australia, it operates out of Sydney, Melbourne, Perth, Brisbane and Adelaide, with flights to Dubai, as well as from Sydney to Christchurch and Bangkok, and from Melbourne and Brisbane to Singapore. 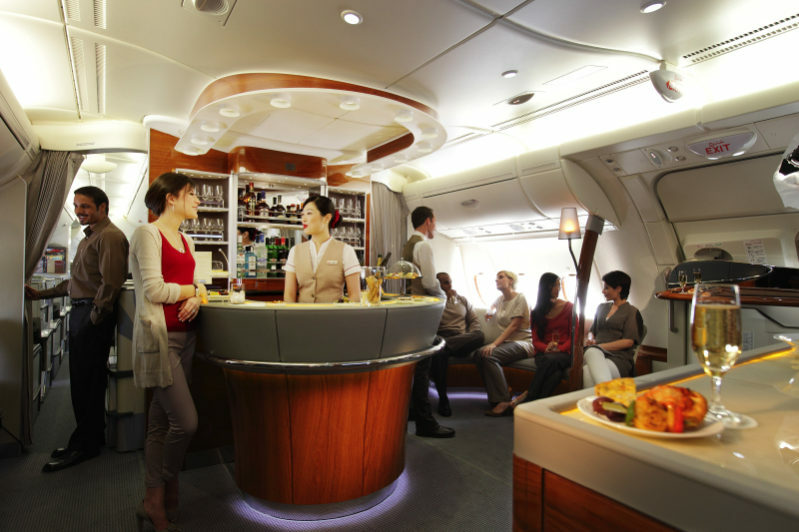 Most flights are operated by A380s, which have the shower and cocktail bar on board (you won’t find these on the Boeing 777s that are also in the skies over Australia. Business class on the 777s is inferior, with a 2-3-2 configuration, but first class (if available) is very good). I’ve reviewed Emirates A380 business class and first class, and you can read those posts for a detailed overview of what to expect. Here’s a summary, along with some tips on how to book. 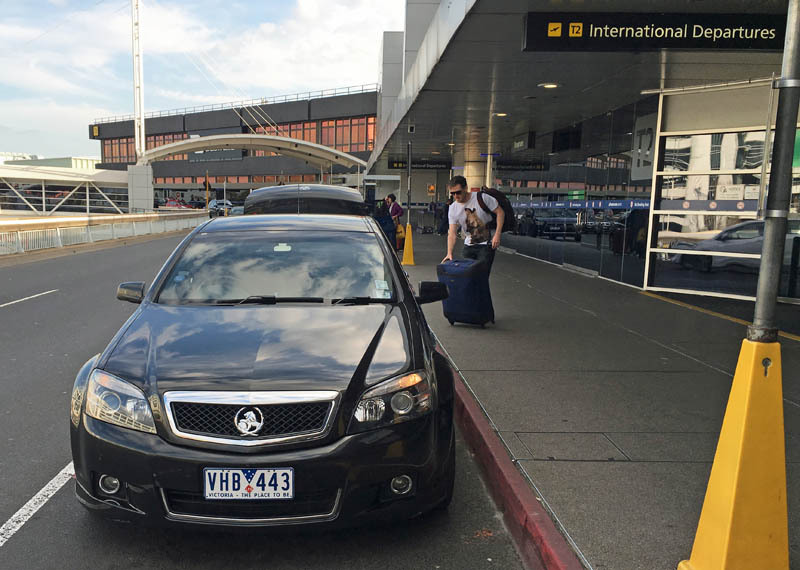 The experience begins before you even step foot on board, with a private driver taking you to the airport. This is a complimentary service offered to all business and first class passengers, including on award tickets, except on flights to New Zealand. At the airport you’ll have access to priority check-in and, where available, a fast track through security and immigration. 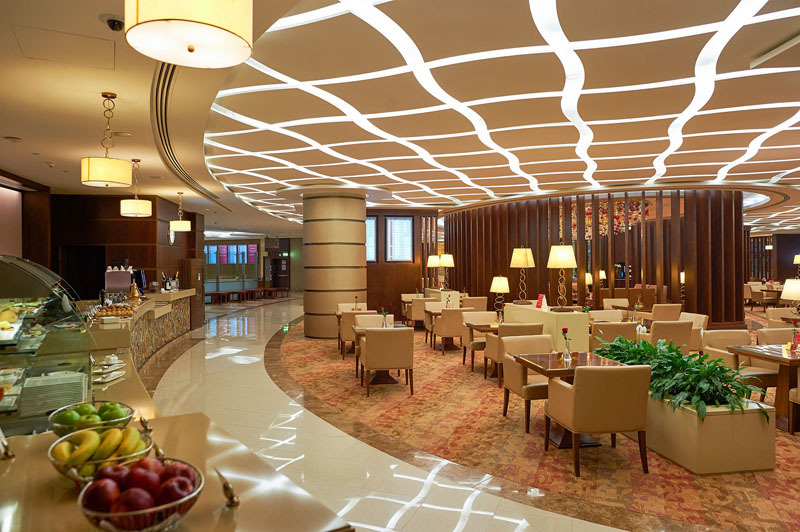 You’ll then relax before your flight in a lounge, either one that Emirates operates or has a contract arrangement with. 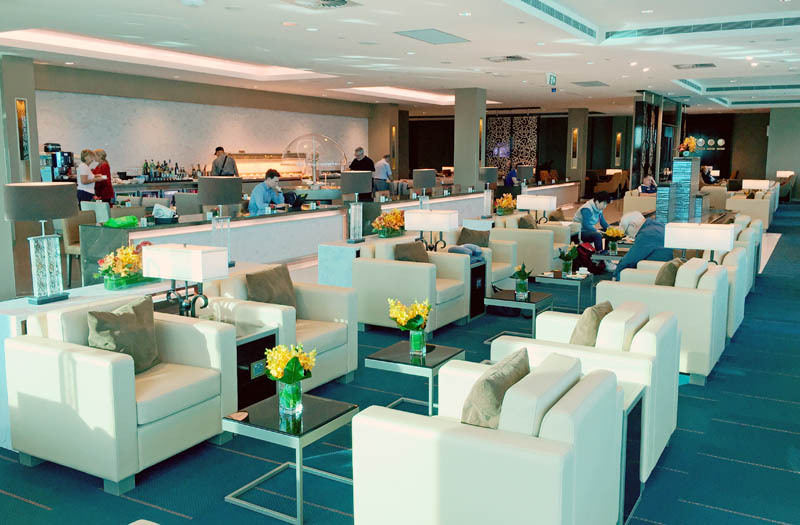 If Qantas and Emirates both operate lounges at the airport, you can choose the one that’s nicer! Once on board, you’ll enjoy spacious seats, quality food and drinks and award-winning entertainment. 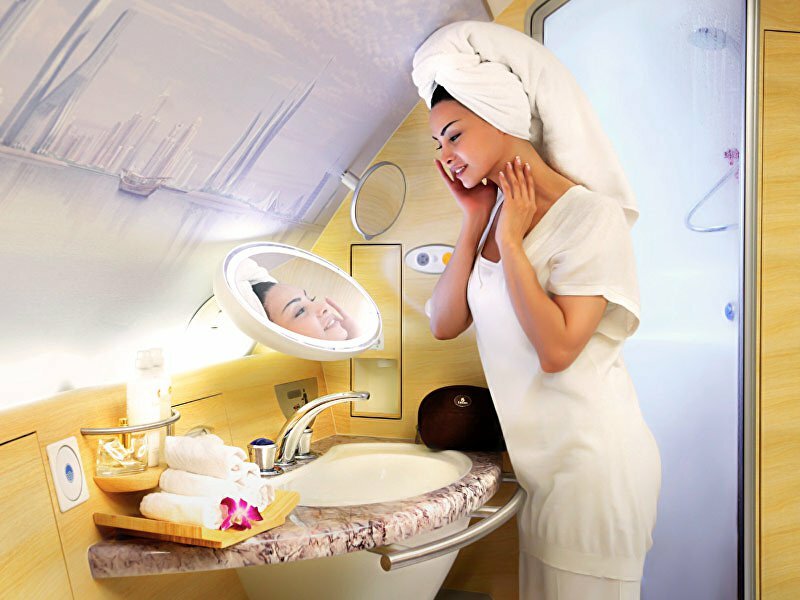 On an A380 (not a Boeing 777), both business and first class passengers can kick back in the bar / lounge, and first class customers can also enjoy a hot shower. 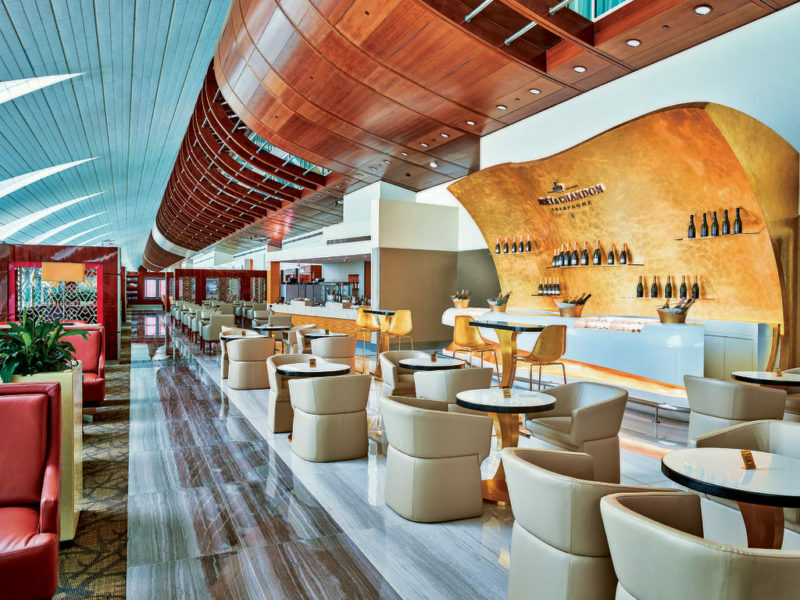 If you’re connecting in Dubai, you’ll have access to Emirates’ huge business or first class lounges at the airport. Finally, when you land at your destination, a chauffeur will take you to your accommodation: no queuing for taxis for you! You can search for and book seats instantly on the Qantas website. Simply log in and search for an award seat on the route you want (make sure to tick “Use points – Classic Flight Rewards only” not “Use money, points or both”). Any available Emirates seats will appear in the search result, along with information about the aircraft, so you can check if it’s an A380 or a 777. 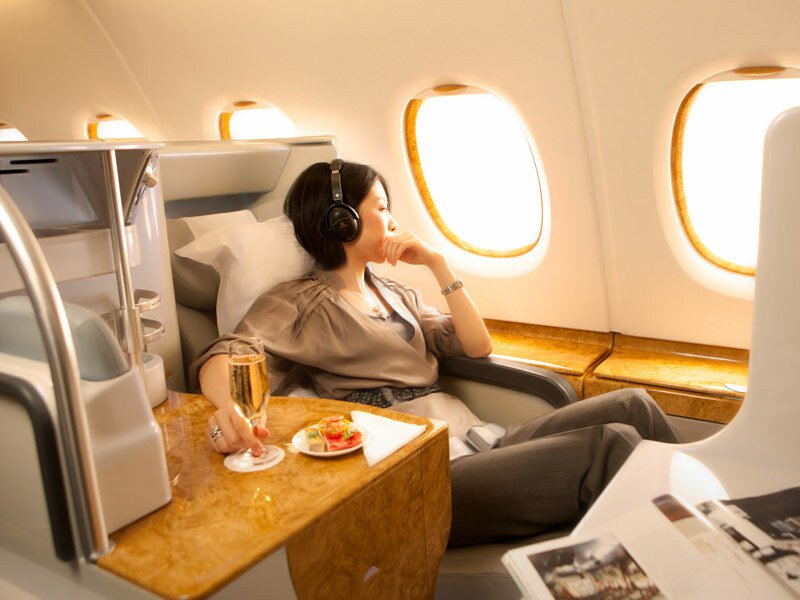 Award seat availability with Emirates is generally quite good, however as with all premium inventory, numbers are limited and you should book as far ahead as you can. Emirates releases seats around 330-340 days out. You can also often pick up a last minute seat if there is unsold inventory, so if you have the flexibility to travel with only a few days notice, that’s a good option. It’s much easier to find award seats outside Australia – no doubt because demand is much lower. Keep that in mind if your travel plans include overseas sectors. You can view Emirates’ route map here. In terms of how many Qantas Points you’ll need, that will depend on the distance flown. There are both long and short flight options from Australia, so even if you don’t have many Qantas Points, you can still enjoy the Emirates experience. The shortest flight is Sydney-Christchurch, which requires 36,000 points in business or 54,000 points in first class. You can also fly Sydney to Bangkok, and Melbourne or Brisbane to Singapore, for 60,000 points in business or 90,000 points in first class. Longer routes from Australia include flights to Dubai and then onwards to Europe, Africa or even the Americas. Here’s Qantas’ award table showing the points needed (you can calculate the distance between cities/airports at gcmap.com). Note that you used to be able to create an itinerary from Australia to the USA via Dubai (i.e. the long way around) using the “multi city” option on Qantas’ website, with a cost of 128,000 points in business or 192,000 in first – but when I just tried that again, it was pricing out much higher, so Qantas may have closed this loophole. 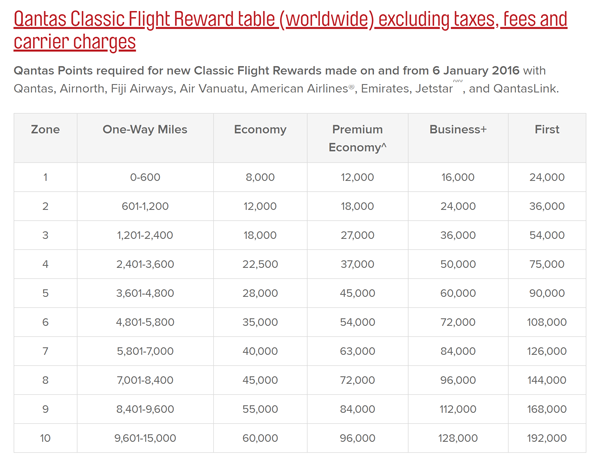 Emirates does impose pretty steep taxes and fees on award bookings. For example, they add up to over $300 on a one way business or first class flight from Australia’s east coast to Singapore or Bangkok. This can’t be avoided unless you’re flying out of Hong Kong, where government regulations keep the fees down (eg. you only need to pay $60 for a first class flight from Hong Kong to Dubai). Despite the high taxes and fees, I still think these award flights are a good deal. Using Qantas Points for Emirates first or business class seats is a superb option for Qantas Frequent Flyers and one of the best uses of Qantas Points. 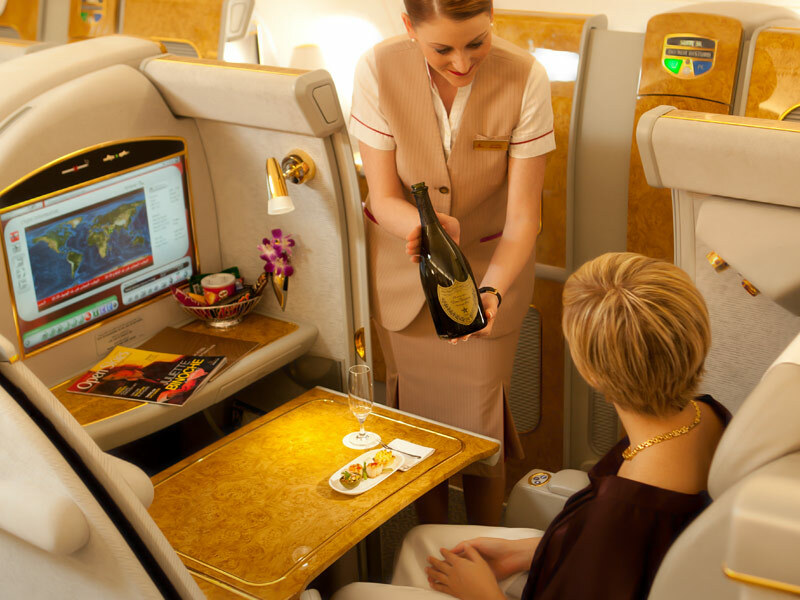 You’ll enjoy great door-to-door service, comfort on board, high-quality food and drinks and some unique experiences in the air – like the A380 onboard bar and shower! To read more about what it’s like to fly with Emirates, check out my reviews of A380 business class and A380 first class. 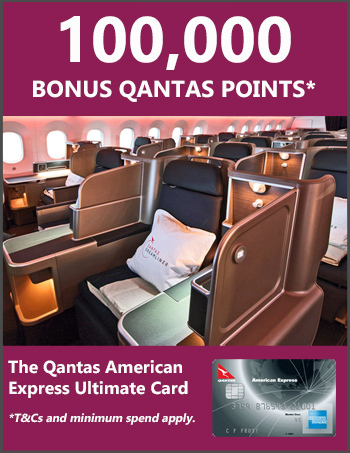 Want more Qantas Points? Check out our current credit card sign-up deals here. Hi I was going to do SYDNEY Dubai SYDNEY on points. I tried to do it online but there was a problem with my Qantas FF account so I made the booking over the phone ( call center in South Africa) I could get a first class seat Sydney to Dubai but nothing coming back so I chose Dubai to Hong Kong. The two reward flights were made under the one booking. After arriving in Dubai I found emirates had released a seat Dubai Sydney in First on the day I wanted to travel home so I tried to cancel Dubai Hong Kong but as it was on the same booking as Sydney Dubai and I had used that part of the booking I could not cancel the Dubai Hong Kong and was told I would forfeit the points (70,000?). I had to book Dubai Sydney separately. My point, if doing reward bookings on multiple sectors make each one a separate booking just in case you need to make a change. I tried getting the points lost on the Dubai Hong Kong leg reembursed but Qantas refused but did eventually refund the tax paid on the sector not used. 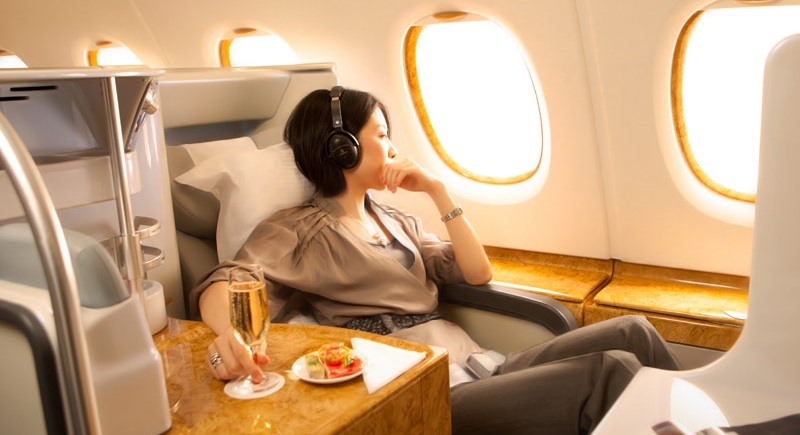 Do you know how I can book seats on Emirates with Qantas points for flights outside Australia? I want to travel from Osaka to Glasgow and cannot seem to find flights from the Qantas site and can’t see how to use Qantas points from the Emirates site. Hi Leah, you should be able to book any flights worldwide via the Qantas website. I’m not sure if Emirates flies to those cities, but assuming it does and you’re not able to see the flights on Qantas’ website through a simple search, try searching with the multi-city tool instead (entering the Japan-Dubai and then Dubai-UK legs as separate flights).